Buy the movie for an incredible experience! I’ve seen all 5 of the Pirates of the Caribbean movies multiple times. In a separate post, I ranked them all. If you’ve already seen that post, this one won’t come as a surprise. 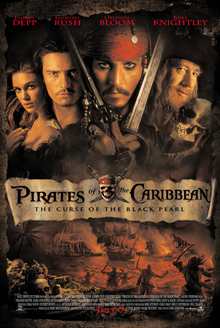 Of course my favorite is the first one, The Curse of the Black Pearl. Not only is it the best movie in the franchise, it’s the best movie I’ve ever seen!! A true swashbuckling film from start to finish, this movie resurrected the pirate genre and spurred a blockbuster series that has lasted 15+ years. Cons: None! 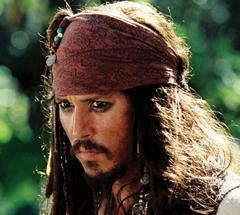 The Curse of the Black Pearl is the most perfect movie I’ve ever seen! In the PotC set, the Wizkids Pirates game saw a ton of useful and awesome pieces from the first movie come to life. Captain Jack Sparrow is arguably the greatest crew in the entire game (fittingly enough perhaps!). The Black Pearl is one of the most fearsome gunships in the game. HMS Interceptor has the potential for blazing speed. 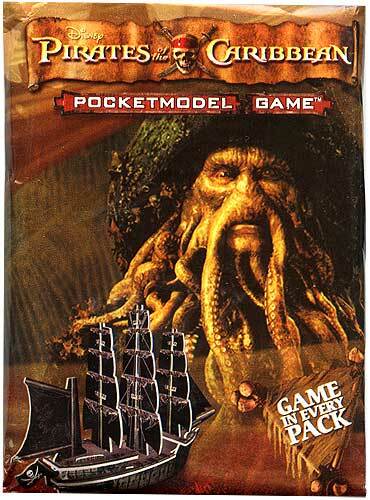 Many other great crew and Unique Treasures make up the set, in addition to the game pieces added for the second and third Pirates of the Caribbean movies. Check out the podcast below for a full overview of the set! What is YOUR favorite Pirates of the Caribbean movie?? Follow this link to find the Savage Shores! 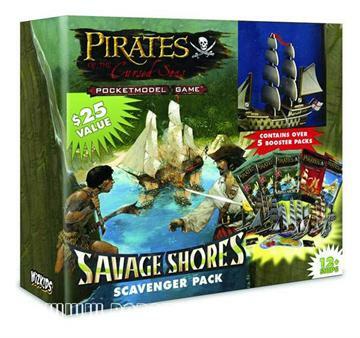 Savage Shores (SS, 2008) became the last set of Pirates CSG. 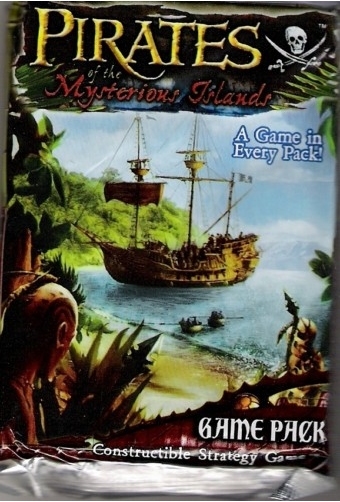 The set was only the size of half of a normal set (just over 50 game pieces), released in Scavenger Pack boxes instead of the normal game packs. 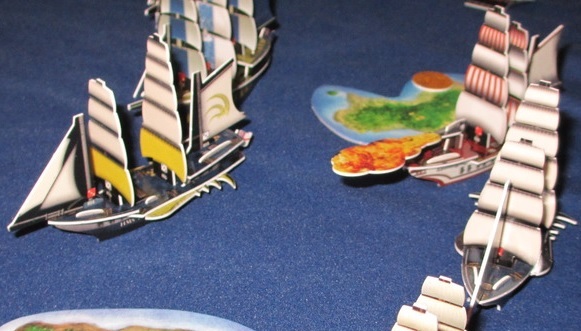 It featured a bunch of new game pieces and ship types despite the small size, and was notable for being the best set for gameplay since at least the Caribbean set. A small blaze of glory before the game went out of print just days after release. You can find all of the game pieces in the Master Spreadsheet, and I’ve ranked the Top 10 here. – Art: 4/5. Definitely stands out, but some ugly ships keep it from a perfect score. I think the named crew artwork was exceptional. – Set Quality: 4/5. Some great stuff, mostly good. 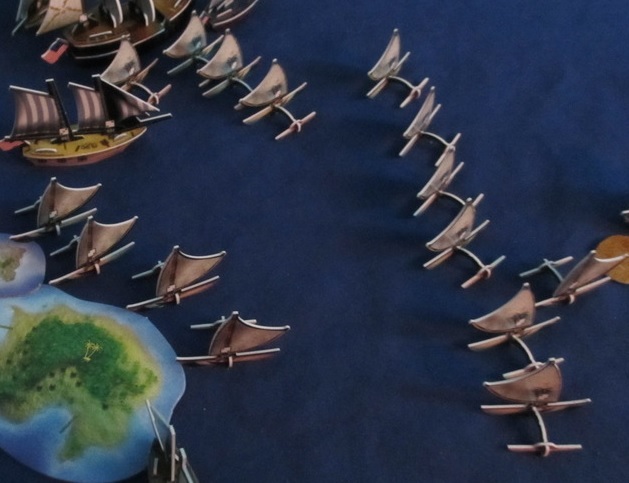 The sea monsters, lack of generic crew, and somewhat unbalanced pieces (navigators, cargo masters, American canoes, Libellule, hoists) keep it from a 5 for me. – New Content: 4/5. Canoes and hoists are both fantastic, arguably too much so. Hoists are the most excusable Pokeship (if they are even considered to be one) simply due to how interesting they are in terms of gameplay. Navigators and cargo masters are both frustrating to deal with in large games, but they’re a welcome addition to most players. – Collectability/Misc: 4/5. The set was almost too easy to acquire, and the box idea caused some consternation among people who didn’t or couldn’t (or still can’t!) complete 10 masters. The SR’s were relatively common as well, but I give the set a 2/3 for collectibility. The Miscellaneous score gets a 2/2 due to the set’s good reputation and a kind of positive farewell after the long decline. The set is generally viewed with very positive vibes due to it being so unique in so many ways, and a beacon of hope that unfortunately never was. = Overall: 16/20. Very good but not all-time great. Discover the Savage Shores here! 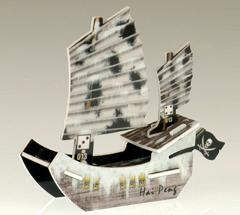 Click to buy PotC on eBay! 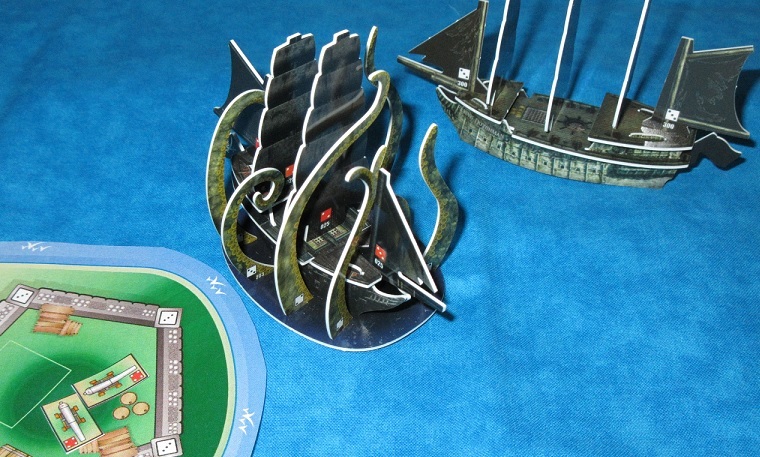 The Black Pearl surrounded by The Kraken in the PotC 10th anniversary game, just like in the movies! 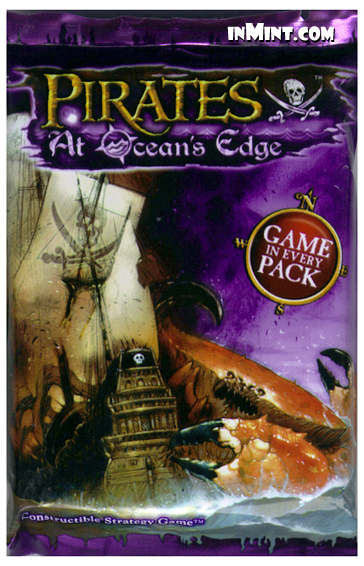 Pirates of the Caribbean (POTC, 2007) saw Wizkids partner with Disney to produce a movie-themed set, with only the Pirates and English as playable factions. It’s a very unique set, and it changed the design of the ships along with the rarity/numbering scheme. For me it’s a fantastic collaboration that makes perfect sense given how similar DJC and OE already were to the Pirates of the Caribbean franchise, but there are some issues. The lack of a Cursed faction and the collation issues (a whole booster box full of commons, for example) plague the set. Great idea, imperfect execution. You can find all of the game pieces in the Master Spreadsheet, and I’ve ranked the Top 10 here. – Art: 3/5. Design changes actually annoyed me, as I found the old look more pleasing and I like using pennants. However, limiting how often the ships break is definitely a good thing. In addition, more rounded hull and mast tabs usually make for easier assembly. The actual artwork was pretty cool and fun to look at. However, a bunch of it was reused from earlier sets, but the biggest problem was the total failure to make the Endeavour, Dauntless, and Interceptor look ANYTHING like the ships from the movies. 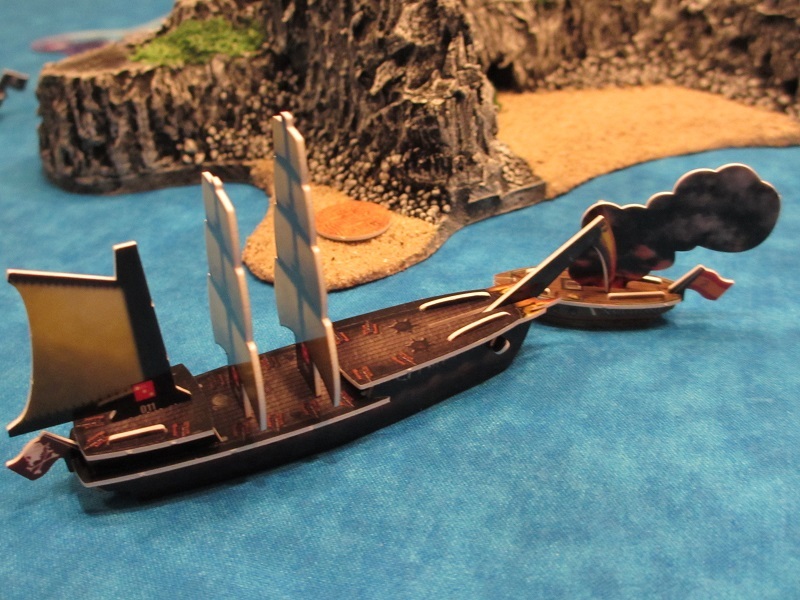 An inexcusable gaffe that nearly ruins the experience of playing those ships (so silly looking that the excellent Flying Dutchman and Black Pearls don’t make up for it). Notable for introducing the split card colors which stayed until the end. I did enjoy the crew and UT pictures, as it really ties the movies into the game quite well. I think the kraken design and artwork is about as good as could be expected. – Set Quality: 3/5. Lots of good ships with a few great ones as well. 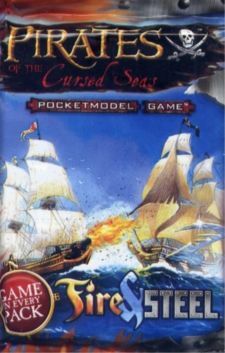 This gave the Pirates and English that many more options (including very nice crew options), which neither of them really needed. 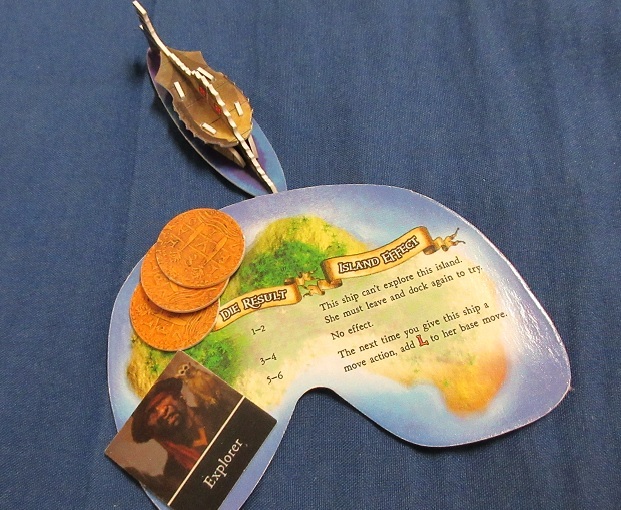 I deducted a point for not having other factions, and another point for the OP stuff (mostly Captain Jack Sparrow, but the Endeavour, Cursed Captain Jack and Kraken Gong have all had somewhat detrimental effects on the game). – New Content: 3/5. Krakens were quite well done overall, as a relatively playable sea creature that effectively incorporated the movie theme. The Parley keyword can be confusing at first and is probably underpriced a little, but it’s definitely a cool addition to the game and another effective movie tie-in. Going a little deeper, this set also introduced a handful of new “1 of 1” game pieces such as CJS, Calypso, the Hai Peng, and Jailhouse Dog. Most of the unique stuff was either confusing or ruined some of the fun, but there’s no denying the importance of those and other game pieces on modern competitive play. – Collectability/Misc: 3/5. Mostly negatives here unfortunately – a small set is easier to collect (which can be a good thing), and there wasn’t much extra stuff (SE/LE/PR pieces) to get. The real problem was when the distribution went awry, with some packs having all commons, and in extreme cases, “god boxes” full of SR packs. Throw in just 2 factions, and even the PotC name can’t save the set from having major collectibility problems. However, the partnership with Disney was absolutely perfect for a game like Pirates, so the Miscellaneous score is definitely a 2 and could be bumped to a 4/5 overall if you value intangibles more than collectibility (or are just a huge PotC fan heh). Though, the change to a rarity-based checklist was a negative. = Overall: 12/20. A great effort with Disney’s help, but with some glaring flaws that make the set quite polarizing. 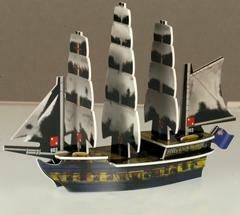 Find Pirates of the Caribbean on eBay! Click to buy Frozen North! 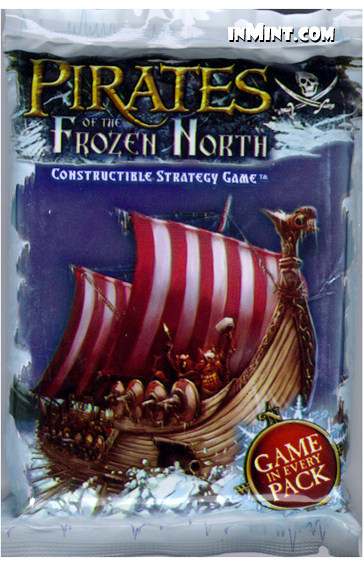 Pirates of the Frozen North (FN, 2007) saw the Vikings sail into battle aboard their Longships. 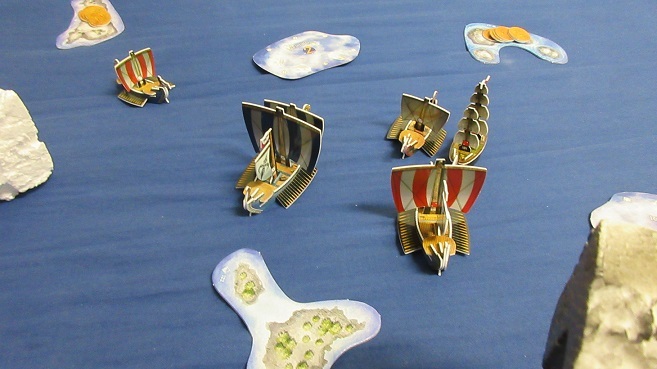 The Vikings are another very poor minor faction, as they have small fragile ships and have trouble in the gold game. 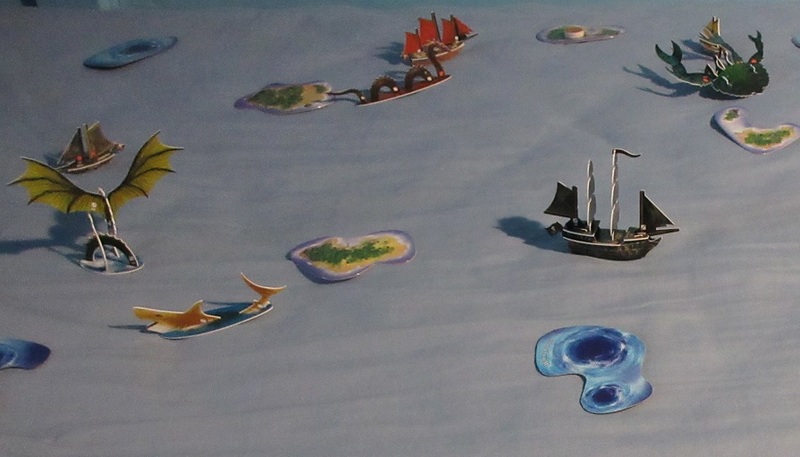 Icebergs were featured as a new terrain option. FN is another slow set, but there are a bunch of very solid game pieces among the mediocre stuff. You can find all of the game pieces in the Master Spreadsheet, and I’ve ranked the Top 10 here. – Art: 3/5. Pretty much all of the longships are interesting, but most of the regular ships are not. The repetitive UT’s and mostly boring named crew don’t help. However, the French and Americans have some very pretty ships, and I think the rather dull look actually fits the theme rather well, keeping the score from being a 2. Though the white look of the cards is also very thematic, it’s hard not to prefer the vibrancy and color of the first 5 or 6 sets in terms of cards. – Set Quality: 3/5. FN continues the trend of more mediocre ships where MI left off. I’ve noticed that the named crew, UT’s, and LE’s seem either fantastic or terrible. Plenty of playable ships, just not a lot that people prefer to use. In addition, I believe Cadet-Captain Mike proved that this was the slowest set for ship speeds. – New Content: 1/5. Wow… where do you even start with this one? Icebergs are by far the most obnoxious terrain type – of course they should damage your ships, but moving them at the beginning of each player’s turn has consistently been the most-forgotten aspect of gameplay in my experience. They’re annoying to no end, and they look silly compared to the reefs and sargassos because they would never be flat. Then we have the Vikings, where the historicity of the set comes into question. Many people have lamented the Viking faction even more than the Mercenaries, simply because the timing of their exploits in real life is so far from the Age of Sail. However, I think the Longship keyword takes the cake for worst new content in this set. Viking longships didn’t even carry cannons as far as I know, but here they get the most potent offensive ability in the game just because they have small ships. The Vikings would be far better off with a different version of the keyword while functioning as a swarm nation. – Collectability/Misc: 4/5. Not much to say here, other than the fact that FN remains one of the pricier sets. = Overall: 11/20. A decent set strictly from a gameplay perspective. A rather strange direction to take the game in, and the reverse power creep continues. Discover the Frozen North on eBay!